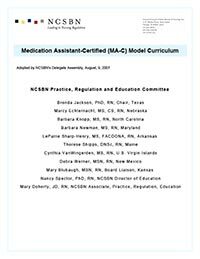 The Medication Assistant Curriculum was adopted by the 2007 Delegate Assembly for those boards that regulate medication assistants. The curriculum includes a preamble that explains the use of the curriculum, the background of its development, recommended hours of training and admission requirements, and defines the terms being used. The curriculum itself includes 5 didactic modules in medication fundamentals, safety, communication and documentation, medication administration, and ethical legal, along with a clinical practicum module.